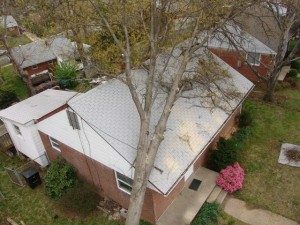 If you have a tree emergency, you need a fast response. Growing Earth Tree Care always has ISA Certified Arborists on call. Call the office at (703) 818-8228. If it is after hours, the outgoing message will give you the cell phone number for the arborist on call. If you don’t reach him immediately, please leave a detailed message and he will call you back shortly. 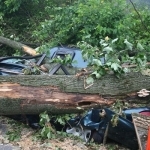 Storm damaged trees can be extremely dangerous. Please keep people and property out of harms way. Place warning signs and ribbon to cordon off the area at a safe distance from the tree damage. Dangerous tree removal can be extremely hazardous. Trees that have fallen or are partially fallen in a storm or other emergency can shift or twist without warning. 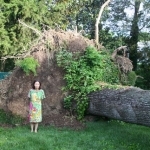 Large trees that have fallen into structures may be precariously supported by the structure and can continue falling. Limbs from a fallen tree are often under tremendous pressure and can cause severe injury or death if cut. lines can electrically charge trees, limbs, metal fences and other objects. Keep in mind that metal fences can be charged from a fallen power line several properties away. Storm damaged and fallen trees are dangerous enough for the professionals. This is not the time for homeowners to risk their lives. Be extremely careful around storm damaged or fallen trees. Stay safe!